This page contains a nunmber of photo galleries of the WILD project. Click the thumbnails to see the corresponding gallery. If your browser does not display the gallery properly, try clicking "Classic view" under the thumbnail instead. Please give proper credits if you use any of the photos on this page. Unless otherwise noted, all photos are by the In Situ group. The platform was installed in early March, 2009. The company that we contracted to create and install the structure did a magnificent job. While they had created many wall displays, this was the first one where the supporting structures had to be flexible to allow various arrangements of the screen. Each screen is on an adjustable mount, and the 32 screens are on 4 movable carts. In addition the top and bottom rows can be oriented. Our first achievement was to create World Map by cutting an image of the world from NASA (Blue Marble) into tiles and using them as the desktop images of the computers running the wall. This created a stunning display without a line of code! Our second achievement was to develop PhotoTreillis to display any image or PDF file on the wall (see the Software page). The astrophysics laboratory IAS gave us some large images that they were able to see for the first time at both full size and full resolution. To look at images with a lot of text, we created the Poster Wall: a display of the 50 or so posters that were created for the 4-year evaluation of LRI. This demonstrates the value of an large, ultro-high resolution display: one can get an overview of the posters and get up close to read the fineprint. The inauguration took place in front of more than 50 people, including top representatives of the partners and supporting organizations. We presented the components of the hardware platform and illustrated its use through several short demos. The LNAO lab from Neurospin specializes in visualizing the brain. They need to visualize a large number of brains simultaneously in order to compare them. We organized a participatory design session where they showed us how they use the BrainVISA/Anatomist application. We then showed them a demo of BrainWall that displayed 64 brain-scans and allowed the user to swap pairs of brains by pointing at them with a laser-like pointer. (See the software page.) Finally we did some rapid prototyping that led to using a physical model of a brain as controller. 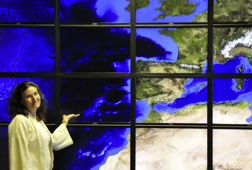 The University of California at San Diego has a very large wall display (5 * 14 = 70 30" monitors). We visited the wall, which is impressive, but were surprised that the only interaction was through a mouse on a computer in the back of the room. This set includes more photos of WorldMap, our display of the NASA Blue Marble image of the earth, as well as a display of Le Ciel de la Terre, a magnificent image of the sky by photographer Serge Brunier displayed by our Photo Treillis software. The set also includes photos of WILDMol, our molecule display and manipulation program, and our first exploration of how to interact at a distance with data displayed on the wall. These photos were taken by a photographer from CNRS for inclusion in their on-line photo archive. The original images are in the TIFF subdirectory (more than 35Mb per image). Please note that all photos are © Phototheque CNRS - Cyril Fresillon. WILD is well-suited to displaying and manipulating collections of documents, not just very large images or diagrams. We used WILD to give presentations with the WebWall application, which can display one document per screen, including videos. This creates a new medium for giving presentations. We also explored the use of paper to interact with the wall. Using the Anoto interactive paper technology, we can write on paper and have the marks displayed on the wall in real-time. This has a number of advantage over other techniques, in particular it is very precise and takes advantage of our skills in dealing with paper documents. This set shows various ongoing projects, in particular the display of data from OpenStreetMap (an open-source geographical information system similar to Google Maps). 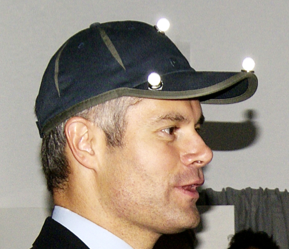 For the inauguration of the PCRI building in November 2011, the Minister of Research Laurent Wauquiez was given a demo of WILD. He even tried it for himself by wearing the cap during the demo of GridScape. Among those present were Guy Couarraze (President of Univ. Paris-Sud), Michel Cosnard (CEO of INRIA), Philippe Baptiste (representing CNRS), Jérôme Guedj (President of Conseil Général de l'Essonne), Pierre Lasbordes (Member of Parliament), Marie-Claude Gaudel (Professor Emeritus at Paris-Sud and head of the PCRI building project). Photo credits: M. Lecompte / PSUD Magazine. For the CHI 2013 conference (Wendy Mackay, general chair, Michel Beaudouin-Lafon, program co-chair), we created an application displaying the entire conference program (about 500 events in 200 sessions, with 16 parallel sessions over 4 days). A tablet interface allowed multiple users to get details about each session and each presentation and to suggest changes to improve the program. This was used in conjonction with software developed at MIT to detect conflicts and provide suggested changes based on author-sourced preferences, called COBI, to create the final program of the conference. This real-world task inspired our work on classification tasks published at the CHI 2014 conference. Credits: © Inria, photos H. Raguet. 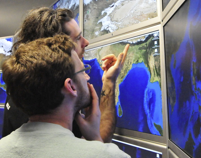 Olivier Chapuis has led the development of Smarties, a tablet interface to control wall-size displays. Here, Smarties are used to control multiple lenses on a map of the Paris public transportation and a Gigapixel image of Paris, letting multiple users control the position, magnification, focal point and position of the lens either independently or collaboratively. Smarties was presented at the CHI 2014 conference.